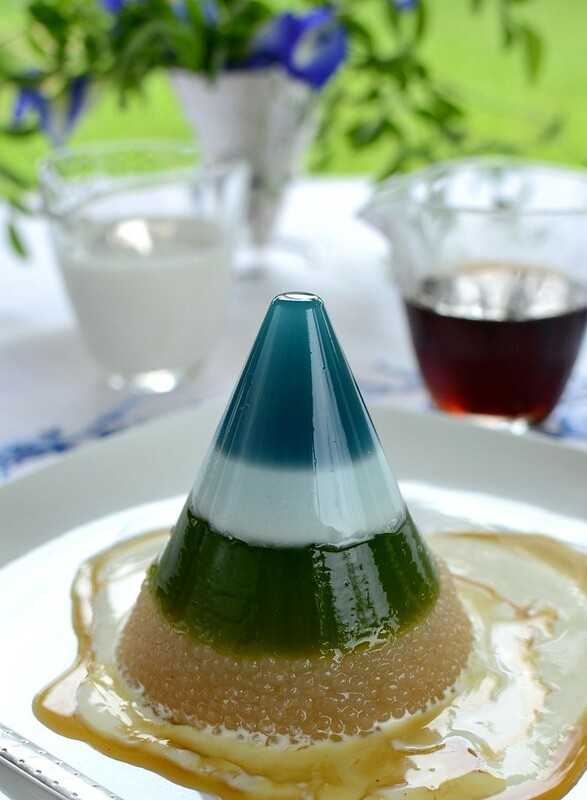 Jelly Kinabalu: Blue layer (the sky) of natural blue dye from bunga telang, white layer (the clouds) of coconut milk, green layer (the padi/rice fields) of pandan leaves and brown layer (the rich land) of sago pearls in gula melaka/palm sugar. Nick Munro the British designer was inspired by mountains when he designed the jelly mould for Royal Selangor Pewter, organizer of the Jellyriffic! challenge to raise funds for the Breast Welfare Association Malaysia. The mould has inspired me to make Jelly Kinabalu, a tribute to the 5th highest mountain in South East Asia (SEA), Mount Kinabalu, in the most beautiful state in Malaysia, Sabah. 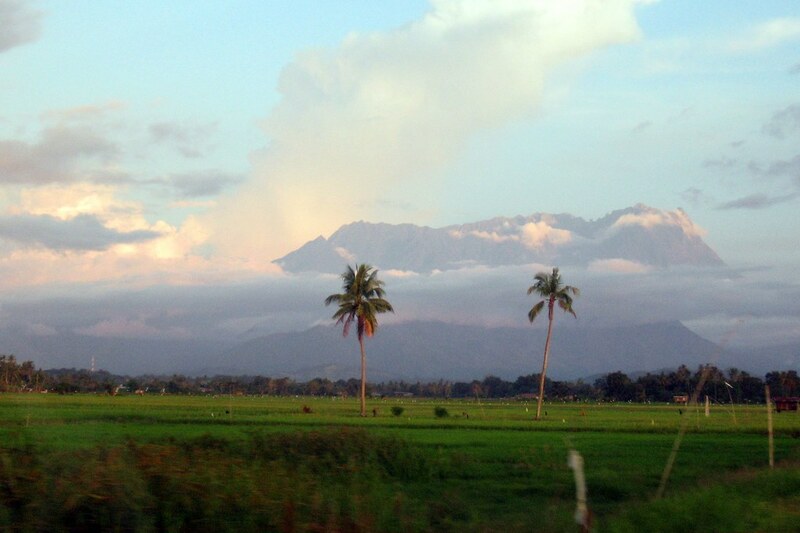 Growing up, Mt Kinabalu was known as the highest mountain in SEA. Now we know that the highest is Hkakabo in Myanmar followed by 3 other mountains in Indonesia. I climbed Mt Kinabalu at 17 and never climbed it again although I wish I did. Climbing Mt Kinabalu at the end of high school is a ritual for the people of Sabah (known as Borneo when it was governed by the Brits); you aren't a true Sabahan until you have climbed the mountain. The climb up is arduous, taking two days to go up and down, but the view from the top and the feeling of having reached the peak are unforgettable although every person I know who climbed said that they'll never climb again and a few years later they forget the misery and up they go again. It's like childbirth. In creating Jelly Kinabalu, I hoped to capture the colors and the feel of the mountain as seen along the drive to Kota Belud and Kudat, towns in the north of the state: blue for the mountain, white for the clouds that hang around the mountain, green for the padi (rice) fields and brown for the rich soil that supports the cultivation of padi by the native people. For the flavors, I've used the bunga telang (butterfly pea, botanically known as Clitoria ternatea for obvious reason) for the blue, fresh coconut milk for the clouds, pandan leaves for the padi fields and sago pearls mixed with gula melaka for the land. The combination was a success--we loved it. Truth is, anything with fresh coconut milk, pandan and gula melaka can't go wrong. 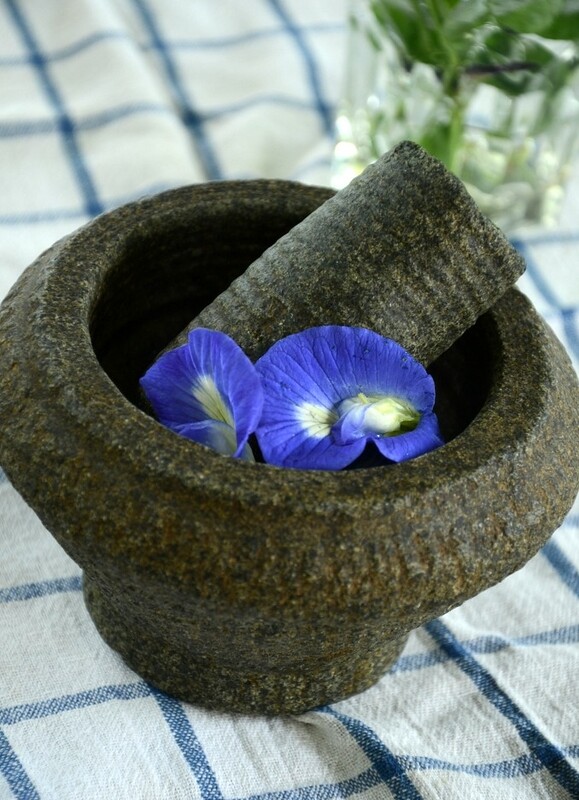 Bunga telang is used in Malaysian cooking for dyeing kuihs (desserts made of starch,sugar,coconut milk and more) and a blue rice dish called nasi kerabu. 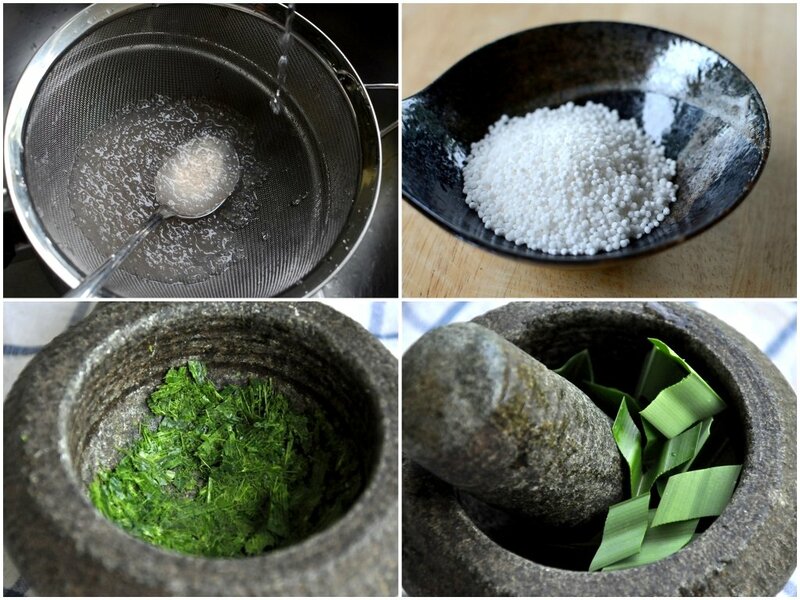 Pandan leaves are widely used in SEA for making cakes and desserts. I think that pandan flavor should be up there with vanilla, a flavoring made from the seed pods of tropical orchids. Gula melaka is the one of the most underrated ingredient in the world, in my opinion. Plain white sugar is nearly scentless but gula melaka, made from the sap of coconut palm, smells so good that I can't sniff it without squeezing my eyes. Be careful though because some gula melaka are adulterated with plain sugar so the flavor is not as intense. Fresh coconut milk is another great ingredient. While cows' milk is subtly flavored, coconut milk is rich, creamy, aromatic and sweet. The richness and flavor of fresh coconut milk just can't be canned or packeted so I never use canned coconut milk or powder for making desserts. Processed coconut milk is fine for savory dishes such as curries because it acts more like a thickener and not so much as a flavoring ingredient as the spices overpower the flavor of coconut milk. Sago pearls have a gentle bite and are fun to eat but are bland and so are perfect for taking on the flavor of other ingredients served with it. 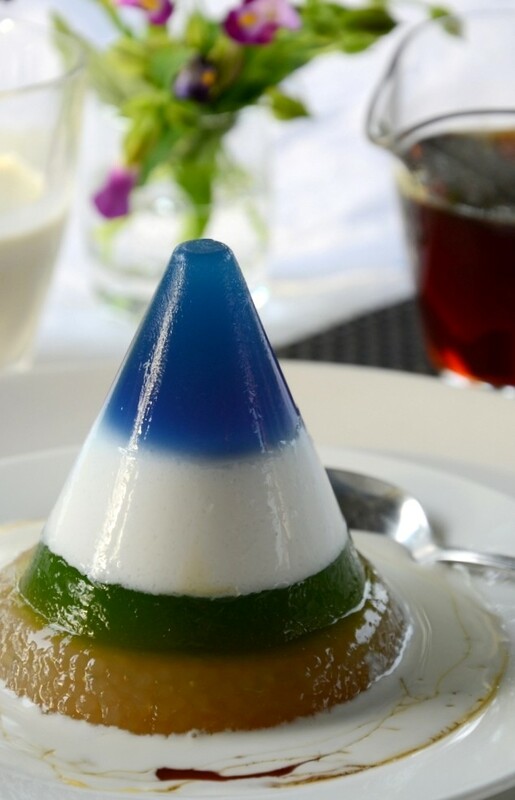 This jelly was made with 3 bunga telang in the top layer and two in the second layer. The blue here wasn't as bright as the first jelly I made (below) probably because less flowers were used and the mortar that I had pounded the flowers in was not washed thoroughly after pounding the pandan. This jelly was made with 5 bunga telang flowers in the top layer and none in the second/white layer. The sago was cooked too soft and that layer spread out under the weight of the top layers. I prefer the white layer here though, instead of the bluish-white layer in the other jelly above. 1) Mix the sugar and agar powder and sprinkle over the water. Heat gently to dissolve. Add the bunga telang juice and stir well. 2) Rinse and stand a Nick Munro jelly mould in a mug and pour the liquid agar in through a sieve. You can work on the next layer straightaway because agar sets quickly. 1) Mix the sugar and agar powder and sprinkle over the water. Heat gently to dissolve. Add the bunga telang juice if using and stir well. Add the coconut milk. 2) Rinse and stand a Nick Munro jelly mould and pour the liquid agar in through a sieve over the blue layer. You can work on the next layer straightaway because agar sets quickly. 1) Mix the sugar and agar powder and sprinkle over 50 ml of water in a small pot. Heat gently to dissolve. Remove from heat. Add the 50 ml pandan water. Stir well. 2) Sieve over the blue-white layer. Chill. 1) Boil the water in a small pot and add the sago pearls. Stir well so that they don't stick to the bottom of the pot. Boil under a gentle flame until half transparent. Cover and turn heat off. After 10 minutes, if the center of the sago is still white, turn heat on again and repeat. 2) Pour the sago over a sieve under running tap water to remove the melted starch. Stir with a spoon until all the excess starch and water are gone. Do not remove too much melted starch or the sago will not stick together well when cooled. 3) Mix the gula melaka in and scoop onto the green layer. Cover with wrap and chill for at least 8 hours. Serve with extra thick fresh coconut milk and gula melaka. Note: I found that the juice from pandan leaves will coagulate into minute little specks when heated so do not cook the juice. Agar jellies are preferably firm but if you don't like that, reduce the amount of agar. love it how you use natural ingredients that are very much part of our day to day lives for the colours! :) and.. that's what sabah is mostly about.... the natural environment! Terri, this is absolutely incredible. In fact, you described the reasoning behind the creation so beautifully, I can almost taste all the different flavors. I'm so so very impressed! I've been so busy this couple of weeks and only just managed to check your blog tonight. I'm just blown away at your creativity! What a lovely and colourful jelly!! I like the whole idea! Like the pink guava s&s, I can feel it in my mouth already. So pretty and realistic. This is so pretty and inspired! Normally we just use bunga telang for nasi kerabu..who know now we can use it aswell for jelly??! !It look yummy!! This looks amazing, what a gorgeous jelly! Ha, i waited for this one yesterday...coming over to see your creations is becoming like a 'daily obsession' :) Another beauty! On another note, i followed your flower buns' recipe and it turned out really well. Thanks for the recipe! And I did a shout out about your participation in this event from there too :) Keep it up, cheers! incredible creation with local ingredients...very original! Those colors are goregous! I almost wouldn't want to eat it! WOW!!! !..everything about this post is perfect...i like the 1st pic very much that i hope you dont mind i save it as my wallpaper. The jelly is indeed make me proud to be a sabahan. This is absolutely perfect! And the write-up about Mt. Kinabalu that accompanied this piece is just lovely. Every layer is such an inspired use of local ingredients. I especially like the bluish-white hue that has such a soft misty look to it, almost like how I imagine the air to be after a rainfall. 10 thumbs up! Beautiful post as always Terri! Am a silent reader of yr blog......always come here for inspiration.....thanks for sharing yr wonderful recipes. Love this series of your photos, beautiful and awesome! and I know this jelly must be very good with all natural ingredients.. This is such an sweep ewes idea!! I mean, awesomeee! Damn u autocorrect spelling! 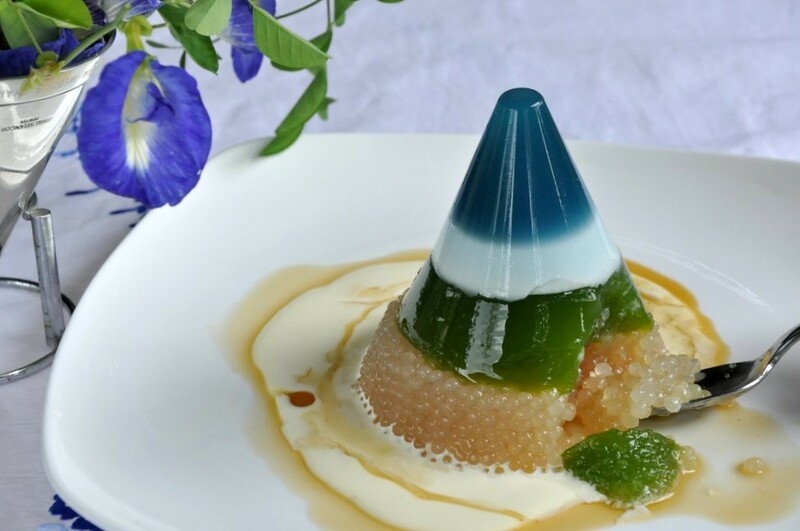 Love your creativity in using natural ingredients to make this jelly to reflect how beautiful Mt Kinabalu is in Sabah. Keep up the good work! Terri - you are sooooo talented (the jellies you've been making are so creative). I may not know you well personally but based on the few times we've communicated and your lovely posts - I can say without a doubt that you truly are a remarkable person. When you embark on a project you give it your all. Keep it up and I (together with the rest of your readers) will be cheering you on by the side. Impressive!!!! Terri, you made the Sabahans so proud of you. yeah!. looking forward to eat this creation. So pretty and what a wonderful idea, paying tribute to a mountain "near" you. The blue is gorgeous. Keep it up Terry! Three more weeks to go. It is a beautiful jelly. The blue is so striking. I would love to taste it! Thanks for the tip about the pandan extract. oh my, who'd ever thought we can gobble up the mount of KK! this is soooo relevant, pretty, and natural. loved this jelly the best among all others so far now! <3 this deserves an award! This has got to be my favourite so far - beautiful vibrant colours and delicious, I'm sure. I can imagine myself tucking into it! How you transferred/interpreted the colours from the photo of Kinabalu scene to your jelly is so amazing and accurate. Awesome!!!! Go Terry Go!!! I think you will win. Wow, you are so creative Terri in marrying the flavoured Jelly with the splendour of Mt Kinabalu.. yummylicious & beautiful.. That's an art! I keep coming back to this and each time it whets my appetite even more! I have a few fav and this is certainly one of them...a feast for the eyes! drooling just thinking what it would taste like! Just beautiful. What a wonderful view you have!